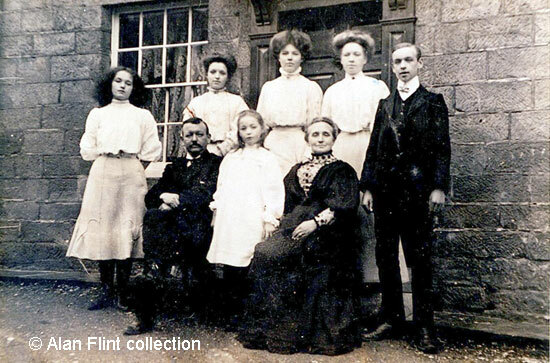 The White family were photographed outside their new home - Woodside on Chapel Hill in Scarthin, part of Matlock Bath. They had moved from Yeoman Street in Bonsall between March and September 1905. This photo was probably taken about 1908.
and Charles Frederick, junior (standing). Woodside is left of centre, partly hidden by shrubbery. moved to Bonsall whilst still a teenager. He was born in Tetbury, Gloucestershire in 1863 and a son of Frederick White and his wife Ruth; Mrs. White died in 1870, leaving her 32 year old husband with five young children to bring up. Frederick was a gardener, although later newspaper articles about CFW were to report that his father was the village cobbler. The young boy was apprenticed to a bootmaker at the age of 10 and left Gloucestershire in 1880. The census of the following year shows him living on Yeoman Street with Henry and Maria Gratton and employed as a boot and shoe maker. He worked as a boot and shoe maker for some time but became interested in politics and served on Bonsall Urban District Council from 1894. He was actively associated with the Liberals from 1903 onwards. After the move to Scarthin he became a member of Matlock Bath and Scarthin UDC and sat on the Matlock Bench. He also served on Derbyshire County Council as a member for the Winster Division but was unsuccessful in gaining a parliamentary seat at the 1910 general election. During his time in Matlock Bath he became involved in the Lea Mills Strike; as a result he was accused of intimidation, elected to go for trial by a jury and was fined. His retirement from the UDC in 1914 was caused by a somewhat disastrous court case (White v. Barnes); he lost the his appeal and was declared bankrupt which caused a by-election. 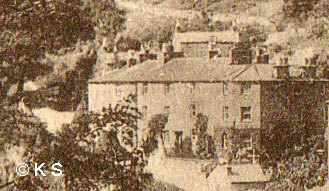 CFW and his family moved from Scarthin to their new home, The Woodlands on Bakewell Road Matlock, during 1917. He nevertheless remained active during WW1 and was discharged from the bankruptcy in 1918. CFW was adopted as the parliamentary candidate for West Derbyshire that year and duly elected; he was returned to Parliament again in 1922. "Charlie" White, as he was known, passed away at The Woodlands on 4 Dec 1923, just two days before a parliamentary election; he had caught bronchopneumonia whilst canvassing in really bad weather. White's death meant that, until an election was held, the constituency was not represented and parliament was short of a member for around three weeks. His last written words were for his wife Alice, "appreciating the fact that any success I may have attained has been due to her steadfastness, courage and assistance". There must have been times during their marriage that were not easy for her to deal with. He was buried at St. Giles; the funeral cortege was said to have been a mile long. Alice was born in Bonsall on 3 Jan 1858 and christened there on 31 Jan 1858. Her parents, William and Jemima, lived in the Dale and William worked at various times as a lead miner, merino cotton weaver and labourer. She married "Charlie" White on 17 Oct 1881 at St. James' Church in the village. The couple had seven children between 1883 and 1899 although they lost their younger son, Frank Leander Mornington White, in 1897; he was a year old. After her husband's death she continued to live at The Woodlands with her second youngest daughter, Winnie, until she died. She is buried at St. Giles'. The White's eldest daughter, known as Gladys, was born at Bonsall on 25 Dec 1883 and christened on 20 Feb 1884. She began her school life at the village school and then attended Cromford Free School Mixed from March 1998 to 20 Feb 1899. She became a monitor/pupil teacher in the school and gained her Headmistress's Certificate there in 1906, but by 1911 had moved away from home. She and her sister Evelyn (see below) were living in the School House at Shirburn, Oxfordshire and were both Elementary School Teachers, with Gladys the headmistress. She married William Hyde, General Sec of Oxfordshire CC Society for National Insurance, on 22 Dec 1913. He was later an Alderman. His father-in-law had wanted him to take over his parliamentary seat but he turned it down as did other family members. Returning to Matlock after his death, Gladys joined her second youngest sister Winifred in buying Oldham House Hydro and setting up The Woodlands School on the premises. When she died on 15 July 1972 she was living at 70 Cavendish Road. Ethel's schooling also began at Bonsall, but she moved to Cromford Free School Mixed which she attended from 6 Jun 1998 to 12 Dec 1900 and then was "at home", according to the school's admissions register. She was born at Bonsall on 17 Dec 1885 and christened on 10 Feb 1886. She was the first of the White daughters to wed, marrying Richard Clay at St. Mary's, Cromford in 1909. The family lived on Orchard Road in Matlock Bath for many years. For a time she worked as a teacher at Holy Trinity school and was both popular and caring but, unfortunately, was quite badly injured in an accident at the school c. 1950. Her teaching career would have undoubtedly ended anyway, unless she had retrained. Her husband and one of her sons pre-deceased her. In 1891 the two year old Evelyn was visiting her grandfather and his second wife in Tetbury. Born in Bonsall on 17 Oct 1888 and baptised there on 17 Apr 1889, she was wrongly recorded as Kate W in the 1901 census. Evelyn began her schooling at Bonsall, moved to Cromford Free School Mixed from Sep 1998 to 12 Dec 1900 until Dec 1903, was a monitor but then attended Matlock Bath. By 1911 she and her sister Gladys (see above) had moved away from home were living in the school house at Shirburn, Oxfordshire and were both Elementary School Teachers. She married John Trewella Carthew at Upton, near Slough, in July 1916. The bridegroom was then serving in the Army, having come from Edmonton Canada to enlist although his mother resided at Belton Old Hall. Carthew was a mining engineer and the couple went to Canada, returning to UK in 1922. Evelyn was in Hastings in 1939 but died in London and, of all the White children, was the longest lived. Charles was the elder of the White's two sons, but his little brother did not survive infancy. He was born in Bonsall on 23 Jan 1891 and baptised there on 30 Sep 1891. He was educated at Bonsall endowed, then moved to Cromford Free School Mixed from Sep 1999 and finally attended Wirksworth Grammar from Sep 1904. After he left school he was apprenticed to a carpenter until he was 19; the following year, in 1911, he was with the Brindleys in Hartington and employed as a joiner for the L.N.W.R. (London and North Western Railway). His Army service records show that he enlisted as a Private at Matlock on 20 Oct 1914, giving his occupation as a Registration Agent and his address as Woodside, Matlock Bath. He was 5' 9" in height and had grey eyes and fair hair. He initially served in the 6th then 2/6th Notts & Derbys Regiment (Sherwood Foresters), being promoted to Corporal on 27 Nov and the following year to sergeant. He was with the regiment in Buxton and married Alice Moore at Devonshire Park Chapel, Fairfield in early 1915. Her address was Kelvinside, The Dimple, Matlock. The Sherwood 2/6ths war diary show that on 9th April three officers joined the 3/6th; he may have gone with them as he was moved between regiments in the Foresters. He was discharged on 1 Nov 1917, having been in the UK for his entire service. He was still as a Sergeant but was discharged under the King's Regulations Para 392 XV1, i.e. no longer physically fit for service. He was elected to Derbyshire County Council in 1928, then unsuccessfully stood for parliament as a Labour candidate in a 1838 by election. He stood again in 1944, this time as an Independent. He defeated Lord Hartington who returned to the Army and was KIA in September, just a few months after marrying Kathleen Kennedy. White stood for Labour in the 1945 election but stood down in 1950 because of ill heath. He had become chairman of Derbyshire County Council in 1946 and performed one of his last duties, opening the County Offices in Smedley's Hydro, just three days before his death. He passed away at Chesterfield Royal Hospital. His wife survived him. Winifred ("Winnie") was born on 23 Apr 1894 though not baptised until 4 Mar 1896. Educated at Cromford Infants and then at Cromford Free School Mixed from 4 Feb 1901, she went on to Lady Manners Grammar at Bakewell from 17 Sep 1908. As her mother was still alive, Miss White returned to the family home - The Woodlands on Bakewell Road - after her father's death and opened a small school on the premises (see Schools in Earlier Times). She and her eldest sister Gladys were to buy the Oldham House Hydro building and turned it into a successful private school, providing a strong musical background for the pupils. An advertisement in 1949 advertised it as "800 feet above sea level. Boarding school for girls. Preparatory School for boys." Also in 1949 Mrs. Dimmock took Matlock by surprise when she was nominated to stand as an Independent candidate for Matlock in Derbyshire CC elections. The seat was retained by F. Wildgoose, also an Independent. A few years later, at a presentation and fundraising concert for a new roof at the Mount Tabor Chapel in Scarthin, she was to recall her childhood years in the village. Her marriage to Herbert John Dimmock did not take place until 1937 although she had known him for a long time as he attended her father's funeral in 1923; they married at All Saints' Church on Matlock Bank. She passed away at Bidstone on Cavendish Road on 16 Jul 1974 and was interred at St. Giles'. Marguerite looks to be about 8 years old in the photo. She was the White's youngest surviving child, born in Bonsall on 17 Feb 1899, and like her siblings before her was christened at St. James on 30 April the same year. She was educated at Cromford Infants and then at Cromford Free School Mixed from 1 Feb 1906, before going on to Wirksworth Grammar from Mar 1910. In 1924 she was appointed secretary of the Chelmsford Division Liberal Association. Whilst he was alive she had assisted father in his election campaigns and the year before she married she was employed as a secretary by Lea Mills. Her husband was John Herbert Dove, a chartered accountant, and they married at Roman Catholic Chapel in October 1929. The couple departed for Minneapolis on 16 Nov 1929, leaving from Liverpool on the Scythia for New York. They were both of Masson Mount, Matlock. By 1939 they were back in the U.K. and residing in Grantham. Marguerite married twice; her second husband was Harold R Swindell whom she married in 1955. She passed away in London. Photographer unknown but image in the collection of, provided by and © Alan Flint. Census returns 1861 - 1911 have been examined. "Derbyshire Times", 8 December 1923. "The Times", 2 Dec, 1923. Obituary notice and article about the "Eve of Poll". Buxton, Doreen and Charlton, Christopher (November 2013) "Cromford Revisited", The Derwent Valley Mills World Heritage Site Educational Trust. ISBN 978-0-9541940-6-2. "Derby Daily Telegraph", 24 January 1912. Report of the assizes and the charge, but the case was not concluded by the time the paper went to press. Derbyshire Courier, 3 February 1912 - committed for trial. Derbyshire Times, 24 February 1912 - fined £20 and ordered to pay costs. "Derby Daily Telegraph", 20 Feb 1914. Also "The Times", Friday, 6 Feb, 1914 - application for a new trial or application to recover damages for alleged slander and libel dismissed. "Derby Daily Telegraph", 13 July 1914. "Derby Daily Telegraph", 3 March 1924. Probate granted for the estate of Charles Frederick White. He had handwritten his own Will. See Matlock & Matlock Bath's Memorial Inscriptions, Surnames W.
 Bonsall Parish Register transcripts, army records and migration information are available on FindMyPast. "Yarmouth Independent", 19 March 1932. "The Times", 28 Nov, 1956. Obituary notice. "Derby Daily Telegraph", 30 December 1944. West Derbyshire by-election. "Ripley and Heanor News and Ilkeston Division Free Press", Friday 30 November 1956. "Yorkshire Post and Leeds Intelligencer", 6 July 1949. "Derby Daily Telegraph", 24 March 1949. "Derby Daily Telegraph", 11 April 1949. "Belper News", 11 November 1955. "Essex Newsman", 26 April 1924. "Derby Daily Telegraph", 30 October 1929.